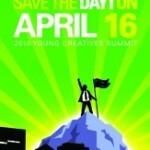 Save the date for the 2010 Young Creatives Summit, scheduled for Friday, April 16th, 2010. Click here to view the save the date card. Plan now to attend! – Help us generate ideas for making Dayton a better place to live, work and play! – Take advantage of the networking opportunities! – Put your stamp on the direction of the Dayton region! – Take quick and easy professional development sessions that will help you learn valuable skills like fund-raising, media communication, leadership, and more. All this jam-packed into a Friday afternoon followed by an after-party to kick-start your weekend. We’ll need your help to spread the word – please forward the save the date card to anyone you think might be interested! This entry was posted on Tuesday, December 22nd, 2009 at 12:33 pm	and is filed under local projects. You can follow any responses to this entry through the RSS 2.0 feed.